In six-figure German limos the rear bench isn’t stowage for the small or an alternative for the lustful. It’s the main event – an office, retreat, or guest room. 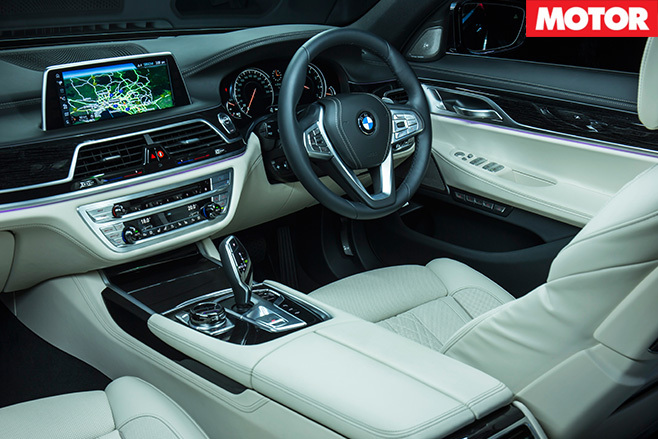 So meeting BMW’s all-new 7-Series, the model set to stamp the company’s mark on luxury car technology and comfort, should appropriately start in its cabin. Or more specifically, in the rear commander’s seat. Besides looking exquisite, our 740i feels lavish and comfortable enough behind the driver to justify the $224K needed to bag this base petrol variant. Lower the middle backrest and you’ll find a 7-inch Samsung tablet nestled in the armrest. 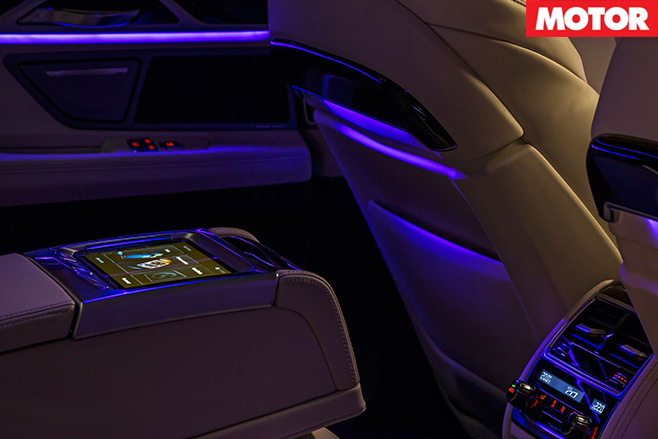 It’ll allow you to play with cabin’s ecosystem or infotainment like a bored toddler. But if that isn’t amusing enough, it can also be pulled from its dock for bouts of Angry Birds. Up front there’s even more to absorb your attention. HVAC information is now displayed on a colour display, likewise the instrument cluster, and the navigation adopts a new menu interface – which can be controlled by gesture. The steering wheel and centre console buttons are finished in cool-to-touch chrome, while leather drenches the gorgeous looking steering wheel. It all makes for a spacious, sumptuous office. 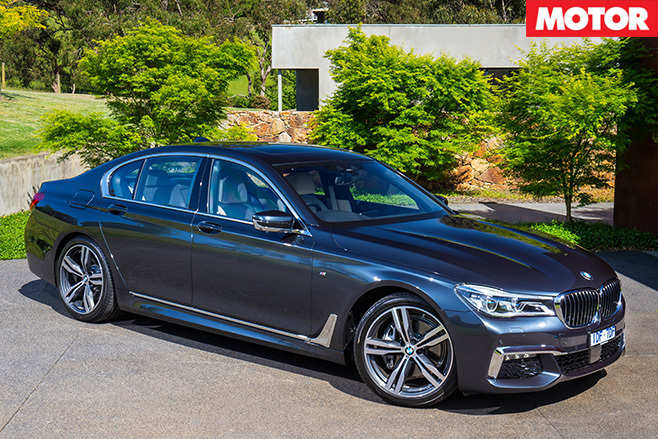 BMW’s hard efforts with the new 7-Series aren’t only isolated to its cabin. Underneath it, Munich’s manage to strip 100kg from the 740i’s bones thanks to a semi carbon-fibre skeleton and part-aluminium skin. Along with the diet, new optional active roll technology adds to its suite of dynamic tricks that includes self-levelling air suspension, rear-wheel steering, and adjustable dampers. As a result the 740i side-steps like a rugby winger. Through tight stuff there’s loads of rear grip, and that signature BMW balance feels to be easily exploitable in this 5.1-metre sedan. That doesn’t mean the 740i forgets it’s wearing a suit. Occupants will enjoy the car’s cloud-like buoyancy as it wafts along in its softest damper mode while still feeling like the suspension has a grip on its 1725kg. The ride’s not magic enough to make rude ridges disappear, though. And the M-Sport package’s run-flat tyres feels out smaller disturbances in urban environments. Another markdown is the steering. It lacks directness on long corners and tricks you into adding more lock than needed. In between bends though the uprated 240kW/450Nm turbo inline-six has no trouble with the weight, and is a sweet match to the eight speed transmission. 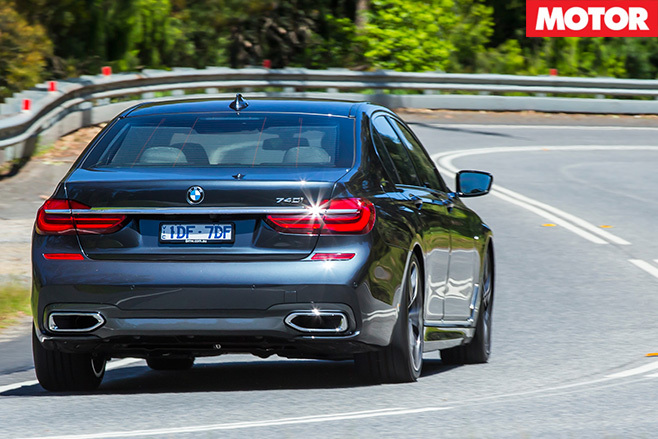 Whether it’ll help nail BMW’s 5.5sec 0-100km/h claim remains to be seen, but the larger question for MOTOR-heads is if the 740i’s better in the front seat than it is in the back. Backseat drivers will relish the space, but guffaw at the options needed to really live it up back there. Scoring a set of the 750Li’s heated/ventilated massage pews will cost $15K. Even the full electric tilt function for the rears will cost $6500. Up front during driving it’s hard to say whether the active roll technology ($5500) makes all the difference, but the 740i’s a decent steer, an even better ride, and a classy place to perch yourself – even if it feels like you’re driving a huge gadget at times. There are cheaper ways to transport five. But in this segment and at this price point, Mercedes-Benz’s S400 only comes in long-wheelbase form, and Audi’s A8 only as a diesel. So until either rival changes tack, we suspect the 740i’s blend of technology, refinement, and petrol-based sporting ability makes it a unique proposition among luxury long-sedans – one you wouldn’t be disappointed with in the front or back seat.